I adapted this from a Japanese cookbook recipe I found online, so I had to do a trial of this cake before serving it to my mothers friends. My family will always forgive me if I do something wrong, but dinner guests will never forget! It’s a good thing I did too, because so many things went wrong … the cake was flat, not moist, and can you believe it – I forgot to add the butter!! 1. When incorporating the dry ingredients into the egg whites, try to be as gentle as possible. When putting the batter into the pan, don’t shake or bang on the pan. The idea is to not disturb the bubbles in the egg whites so the sponge comes out soft and … spongy! 2. 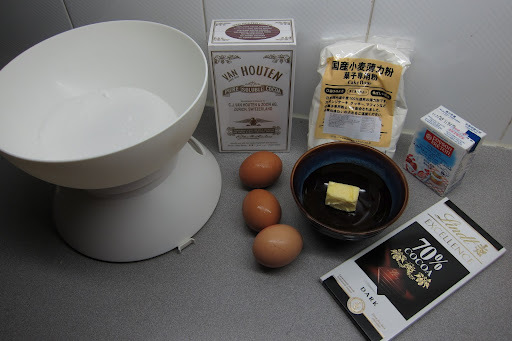 For the same reasons, I tried to limit the amount of time between mixing the batter and baking. 3. 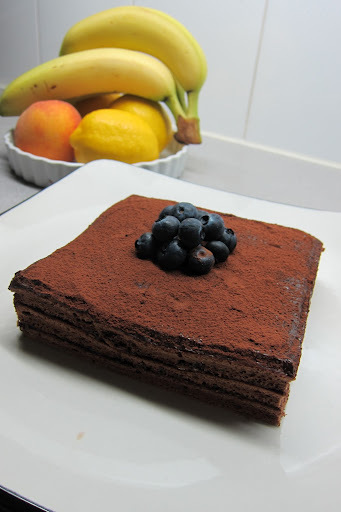 Using chocolate with 70% cocoa mass will give the cake a more decadent taste. 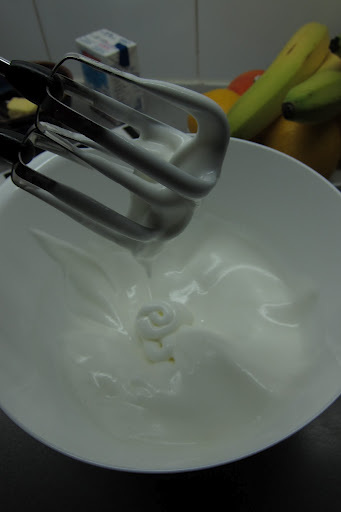 Using a hand mixer, beat the egg whites, adding the sugar gradually until stiff peaks form. 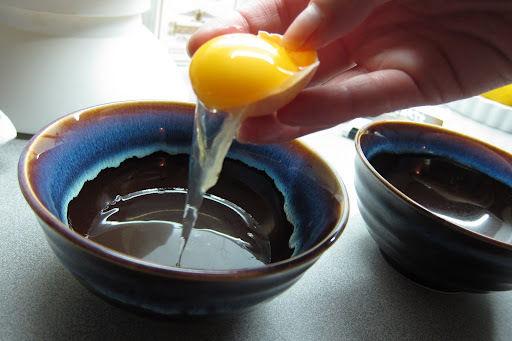 Pour the egg yolks into the mixture. Beat at low speed for one minute. 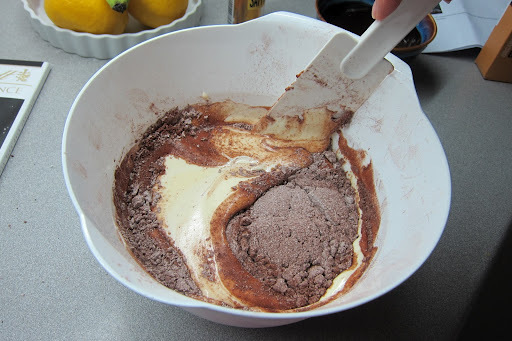 Sift the flour and cocoa flour into the bowl and fold gently to combine. Add the melted butter and combine, then pour the batter into the prepared pan. Bake for 10 minutes until the top is light and springy to the touch. 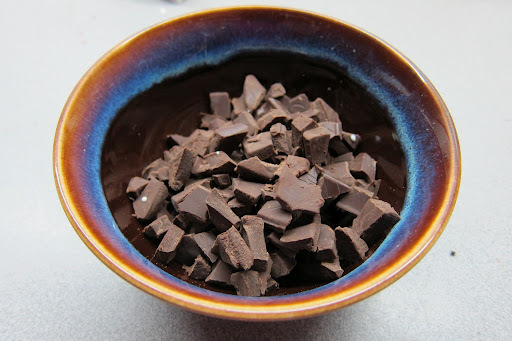 Boil the whipping cream and pour the hot cream over the chocolate.Leave it to melt for 1 minute, then whisk lightly to combine and add the rum. To make the syrup: Mix all the ingredients in a small pan and bring to the boil. Let cool. Cut the cake into 4 pieces, brushing each one generously with the sugar syrup. 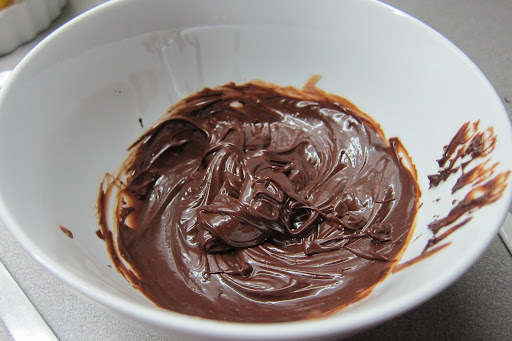 Spread the ganache over each layer generously, layering as you go. Save the nicest looking layer for the top, spread the final layer of ganache thickly and sprinkle with cocoa powder.Decorate the cake with berries, and scatter berries around the platter.Optional: serve with a dollop of creme chantilly – for extra decadence. 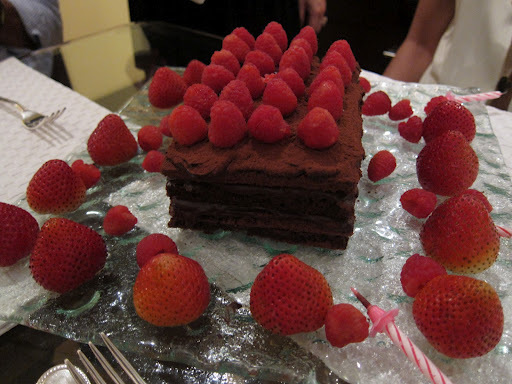 I love your blog, and if I weren't about 2.5 stones overweight I would love this cake too! Maybe it can be my treat when I reach my target weight….